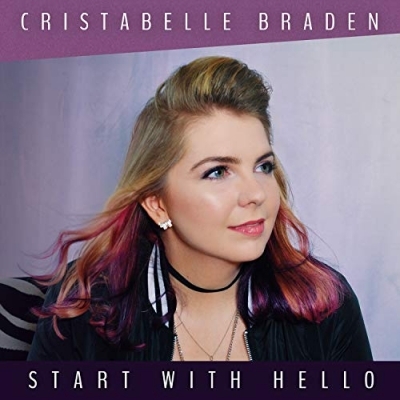 Pop singer/songwriter Cristabelle Braden has released her new album, 'Start with Hello'. The album brings a message of confidence, identity, and survival. Through her struggles, Cristabelle has come to a greater strength, which clearly shows through her passionate vocal performance and songwriting. The album brings an empowering message of how to acknowledge and overcome fears, doubts, and insecurities with a simple hello. Read More Pop singer/songwriter Cristabelle Braden has released her new album, 'Start with Hello'. The album brings a message of confidence, identity, and survival. Through her struggles, Cristabelle has come to a greater strength, which clearly shows through her passionate vocal performance and songwriting. The album brings an empowering message of how to acknowledge and overcome fears, doubts, and insecurities with a simple hello. As a survivor of traumatic brain injury, Cristabelle has had to learn to navigate a world that’s full of uncertainty; she has come from re-learning daily life tasks in brain injury rehabilitation to setting her feet firmly on the ground as a songwriter and artist with a message of hope. With relatable lyrics, Cristabelle’s upbeat songs speak to her open conversation in life about hope, love, and faith. Start With Hello shines the light on vulnerable moments in her journey and how out of those moments healing is found. Cristabelle is a living testimony and fights for what she believes in, through her music, speaking, and advocating for brain injury. She is active in her organization Hope After Head Injury, providing support and resources to survivors and caregivers living with this journey. Most of all, Start With Hello is an invitation - come and join Cristabelle on this journey of hope.